It’s been awhile but it is with great pleasure and pride that we bring back our Member of the Month award. So many awesome and commendable things happen at Saxon CrossFit every month that it is impossible to mention them all. But what we can do each month is highlight a Saxon who has gone above and beyond in their effort, achievements and dedication each month. Impressing us in August was non other than Sam Hunt. Our resident body weight ninja has been killing it the last few weeks with phenomenal attendance levels, some serious lifts and an unmatched work ethic in every class. Always a part of socials, always involved in events and always deep in the banter Sam is a key player in our community and an absolute asset to it. Keen to learn, keen to improve and friendly as a labrador, Sam is a legend and it has been a pleasure having him a part of Saxon so far!! 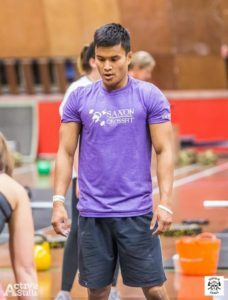 What bought you to Saxon CrossFit? Whilst working abroad, just by chance, I came across the CrossFit games on TV. From there I was fascinated and hooked on CrossFit. When I got back to the UK I decided to pursue this and googled CrossFit and there it was, Saxon. What’s the biggest change Saxon CrossFit has had on your life? With out a doubt it has to be the people ( yes even Tim). I have met and made so many new friends from the box. What’s your favourite thing about Saxon? There are different things that stick out in my mind. First of all it has to be the coaching. I believe that many people would agree that the high level of coaching we receive at Saxon is probably one of the best you will find anywhere. Secondly, and I know its cliche, but it has to be the community. Meeting and training with so many different people from so many different walks of life is what makes Saxon great. (I have to give a shout out to Vearnon and Sharon who have provided the Saxon community with great opportunities to get to know each other and socialise out side of the box.) The last thing I would say is seeing the dedication from everyone. Whether its from just turning up day in day out, putting in a strong performance on a workout or nailing a PB I love seeing the expressions on peoples faces and the support around them when they achieve it. This is what makes Saxon CrossFit so great and I feel very fortunate to be part of it and accepted in your community. Anything that has a gymnastic element. I love doing handstand pushups or walks and muscle ups. If a work out has a heavy barbell involved I also really enjoy it – well the feeling after anyways. Describe Saxon in three words? Tell us something about yourself the other members won’t know? As some of you may know I used to work on cruise ships in the Caribbean . During that time I entered a talent competition called Mr and Mrs Paradise in which I came second. I had to showcase a talent so obviously I did a live rap on stage. Footage of it is hidden in safe undisclosed location! !